Please Note: There are fields to be filled in after printing. This form does NOT auto-calculate the balances. In accordance with ORS 90, Owner/Agent may claim: unpaid rent, utilities/services, fees, cleaning, landscaping damages, damages to rental unit, pet damages and recover rent for the days necessary to prepare the rental unit for re-renting. Owner/Agent must provide Tenant(s) an accounting within 31 days of termination or surrender of the property. 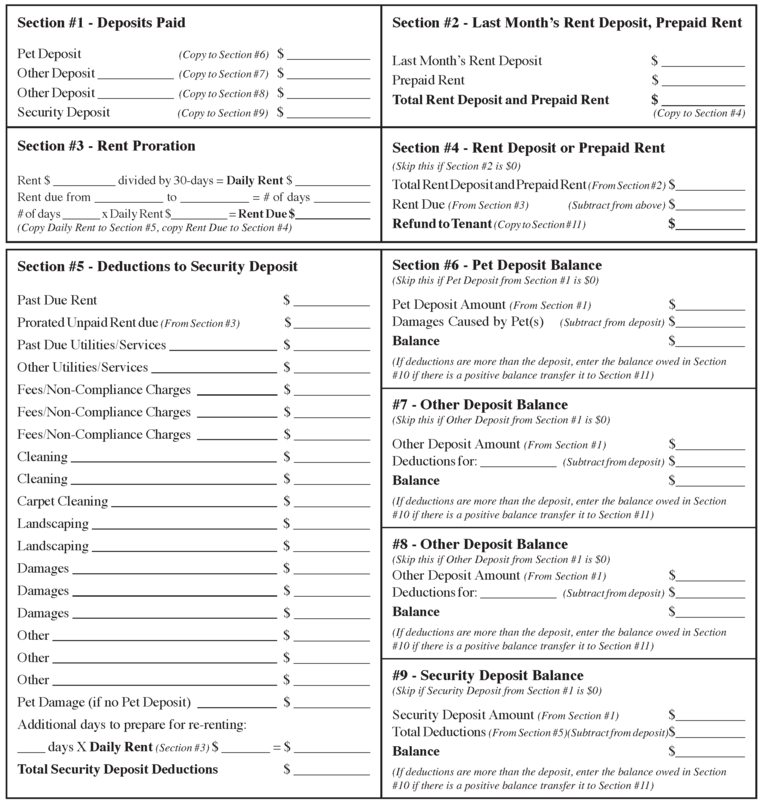 If Tenants are due a refund (see Section #11), a check is enclosed for the total amount of the refund. Depositing or cashing the check constitutes acceptance as payment in full. If there is a balance due the Owner/Agent (see Section #10), the total amount owing is due immediately and must be paid within 10 days. If payment in full is not received within 10 days, appropriate legal and/or other actions may be taken to collect the amount owed. Actions may include, but are not limited to; filing a Small Claims suit, Wage Garnishment, assigning to a Collection Agency and/or reporting to a Credit Reporting Agency. If you can not make the payment in full within 10 days, the Owner/Agent may be willing to make payment arrangements. Contact Owner IMMEDIATELY for payment options.